Nourkrin® Woman with the unique Marilex® helps support, normalise and maintain the Hair Growth Cycle by carefully providing the correct nutrients to the hair follicles. Today, the award-winning Nourkrin® Woman is appreciated by women around the world. So far it seems to be working, hair thicker and growing in places that were sparse would recommend this product. Up to 60% of women will experience a hair growth disruption. Yet, no matter what type of female hair loss occurs, the Hair Growth Cycle is almost always affected. Stress, Genetics, Diabetes, Poor Nutrition, Hyperthyroidism, Cholesterol, Medication, Childbirth, Hormones, Hypertension, Hairstyling and others. Nourkrin® Woman with the unique Marilex® is scientifically formulated to help maintain a normal Hair Growth Cycle, which helps to support normal healthy hair growth. Nourkrin® Woman is completely safe and 100% drug-free. Nourkrin® Shampoo & Scalp Cleanser has been developed to provide a gentle, yet thorough cleanse to support and nurture a healthy hair growth environment. Nourkrin® Shampoo & Scalp Cleanser has been clinically formulated specifically for women and men experiencing hair loss and thinning. Gentle enough for everyday use, it is pH regulated to be kind to damaged hair as well as fine, new hair growth. 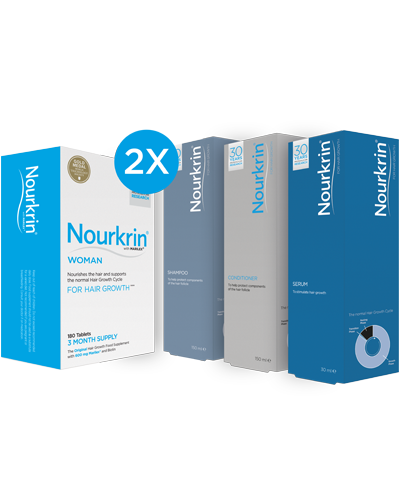 For best results, use Nourkrin® Shampoo & Scalp Cleanser only in combination with Nourkrin® WOMAN or Nourkrin® MAN tablets. Nourkrin® Conditioner has been developed to gently moisturise and condition delicate hair as well as to support and nurture a healthy hair growth environment. 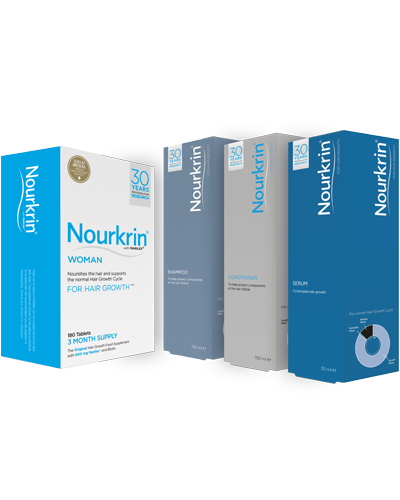 Nourkrin® Conditioner has been clinically formulated specifically for women and men experiencing hair loss and thinning. Gentle enough for everyday use, it leaves fine and delicate hairs in a soft and tangle-free condition, conducive to healthy hair growth. For best results, use Nourkrin® Conditioner only in combination with Nourkrin® WOMAN or Nourkrin® MAN tablets. Nourkrin Scalp Serum has been developed specifically for women and men experiencing hair loss and thinning. Nourkrin Scalp Serum is scientifically formulated to promote normal hair follicle function to encourage hair growth. It nourishes the scalp and hair follicle to stimulate natural growth of healthy hair. Recommended for daily use, it is specifically formulated for all hair types including fragile and delicate hair. For best results, use Nourkrin Scalp Serum in combination with Nourkrin® food supplement tablets and other products in the Nourkrin® range. Subscribe to our newsletter to stay up to date on the newest research within the field of hair growth disorders and female hair loss, information about upcoming events and competitions with Nourkrin® Woman.